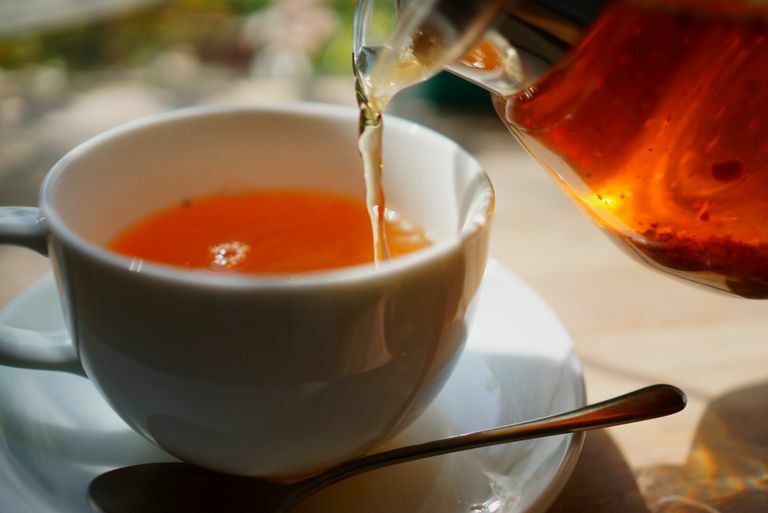 Traditional plain tea—black, green, or white—is made from the leaves of the Camellia sinensis plant, which is not related to the gluten grains wheat, barley, and rye. Therefore, plain hot or cold tea made from tea bags or loose tea should be gluten-free, assuming it hasn't been subjected to gluten cross-contamination in processing. But that's not the end of the story with tea. Not all teas are made from Camillia Sinensis, and even some that are made from real tea leaves can contain added gluten ingredients. For example, some herbal teas contain barley malt as a sweetener, and some "real" teas have gluten-grain-based flavors (most frequently from barley) in them. That makes it essential to check the ingredients before you take a sip. In addition, a form of tea made from roasted barley is popular in some Asian countries, including Japan, Korea, and China. Therefore, you'll need to determine exactly what you're getting when you order "tea" in a restaurant featuring Asian cuisine. For tea drinkers, it's definitely a case of "buyer beware" when it comes to gluten. However, most major tea companies keep gluten-free lists (and some are even certified gluten-free), so it's quite possible to find a type of tea you enjoy that's also gluten-free. Note that the following list applies only to tea bags and loose tea used to make hot and iced tea. If you're looking for bottled iced tea brands and flavors, check out the list. Bigelow teas. All of Bigelow's extensive selection of teas are considered gluten-free, according to the company, including popular flavors such as English Breakfast, Constant Comment, and Sweet Dreams herbal tea. Celestial Seasonings. Most of Celestial Seasonings' teas are considered gluten-free to at least 20 parts per million, but two contain roasted barley: Roastorama and Sugar Cookie Sleigh Ride. The company says in its gluten statement that it will call out gluten-containing ingredients on its labels (Roastorama and Sugar Cookie Sleigh Ride are marked "Contains gluten") and that it will label safe teas "gluten-free." Lipton tea. Lipton, which is made by Unilever, does not publish a list of gluten-free tea varieties. However, the company states that it will disclose any gluten ingredients on the label. "We recommend that you read the label each time before buying our product. If gluten is present, it is clearly listed in plain language on the ingredient label (i.e., wheat flour, rye, barley, oats, and malt)." There's also no gluten-containing glue in Lipton tea bags: "We do not use any glue in the assembly of our Tea bags or tags. Where a staple is not used, we use pressure and heat to adhere the string to the tag and the bag." Mighty Leaf teas. Mighty Leaf teas are certified gluten-free by the Gluten-Free Certification Organization (GFCO), which has standards that are stricter than the current U.S. legal standard for gluten-free products. Look for "GF" in a circle on the package. Those who are sensitive to corn should be aware that Mighty Leaf uses tea pouches made from cornstarch, and those who are sensitive to dairy should note that the company's Truffle Teas may contain dairy. Numi Organic tea. Numi offers fair trade, 100% organic non-GMO tea varieties. According to the company: "all Numi Teas are gluten-free. Our teas are packaged in facilities and on machines that do not process or work with gluten." Numi teabags are made from manila hemp cellulose plant fiber. Red Rose tea. Red Rose black tea, English Breakfast tea, its decaffeinated black tea English Breakfast tea, and its Earl Grey tea are gluten-free, according to the company. Republic of Tea. Republic of Tea holds gluten-free certification from GFCO, which means its gluten-free-labeled teas contain less than 10 parts per million of gluten (see the company's statement). However, make sure the package you purchase actually is marked with that "GF" circle logo since the company doesn't guarantee all its flavors are safe. One tea flavor—Coconut Cocoa Cuppa Chocolate—contains barley, which of course is a gluten grain. Stash teas. According to a statement from Stash: "We actively maintain signed statements from our ingredient suppliers stating that all ingredients purchased by Stash Tea Company are gluten-free. We do not use barley malt in any of our blends." The maltodextrin in Stash iced green tea powder is from corn, and the company's tea bags are made from wood cellulose. Tazo teas. Tazo, owned by Starbucks, does not disclose which flavors contain gluten. It formerly had said that Green Ginger, Tazo Honeybush, Lemon Ginger and Tea Lemonade contained gluten in the form of barley malt—these currently list "natural flavors" on their ingredients lists. Beware of ordering Tazo tea in a Starbucks shop, since the baristas use the same tongs to pull out each tea bag, so cross-contamination is fairly likely. Teavana teas. Teavana also is owned by Starbucks. Previously, all Teavana teas were considered gluten-free, but unfortunately, the company now is including the statement "May contain gluten" on certain flavors. Make sure to read the ingredients label carefully, and avoid products with this statement. You also should assume that all flavors could be subject to gluten cross-contamination. Tetley teas. The company states that: "All of the tea bags packaged for Tetley USA Inc. for retail sale, including our decaffeinated, flavored and green blend tea bag products are gluten-free." Twinings teas. Twinings states that: "All Twinings teas, herbal infusions, and flavored fruit infusions do not include gluten ingredients." The products also are free of genetically modified ingredients, according to the company. Yogi tea. All teas currently made by Yogi Tea are considered gluten-free. However, four teas—Stomach Ease, Healthy Fasting, Calming, and Kava Stress Relief—used to contain gluten, and the company warns consumers to check the packages of those teas to make certain they're purchasing the latest, non-gluten-containing version. When you're buying tea bags or loose tea, you obviously have a bewildering number of options. It's fortunately pretty easy to wind up with a tea that's gluten-free, but you can't let your guard down—some teas do contain gluten ingredients, most often in the form of barley and barley malt. If you're particularly sensitive to trace gluten, stick with a brand that's certified gluten-free, such as Mighty Leaf or Republic of Tea. You also can consider purchasing a brand such as Numi or Stash that doesn't make anything with gluten ingredients.